I’ve never made savoury muffins before, but I wanted to try something different to go with soup. I’m definitely a ‘convert’ now. They smell wonderful and tasted even better! They could also be served with some homemade chutney. Line a muffin tin with 10 muffin cases. Put the flour and xanthan gum into a bowl. Mix the milk, eggs and butter together and mix well. Pour the mixture into the flour and mix until just combined. Stir in the cheese, spring onions, herbs and salt and pepper. Spoon the mixture into the muffin cases (an ice cream scoop is about the right size). 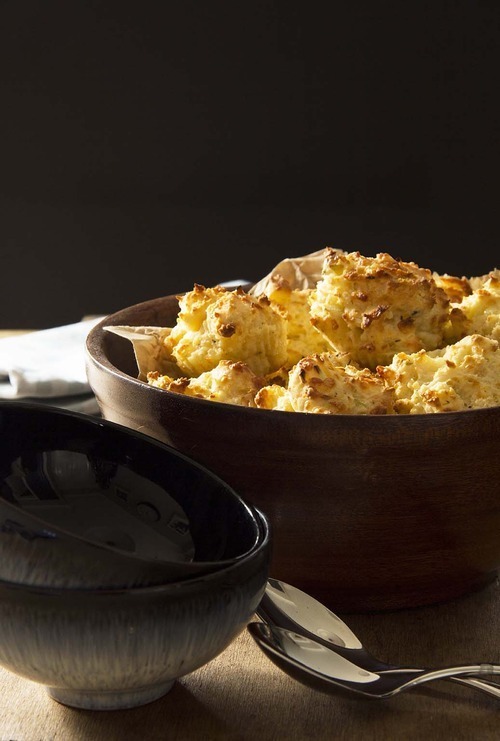 Bake in the oven until risen and golden brown – around 15 minutes. They can be reheated for 5 minutes in the oven. Put the oil, onions, carrots, celery, potatoes and bay leaves in a large pan. Cook gently until the onions have softened. Stir in the tomato puree, sugar, vinegar, chopped tomatoes and passata, chilli flakes then crumble in the stock cubes. Add the boiling water and bring the soup to the boil. Simmer for 25 minutes until the potatoes are tender. Cook for a further 10 minutes if it needs its so it purees properly. Remove bay leaves and cool slightly. Puree with as stick blender or in a food processor until it is very smooth, and pop it in a clean pan. Season to taste, adding another pinch of sugar if it needs it. 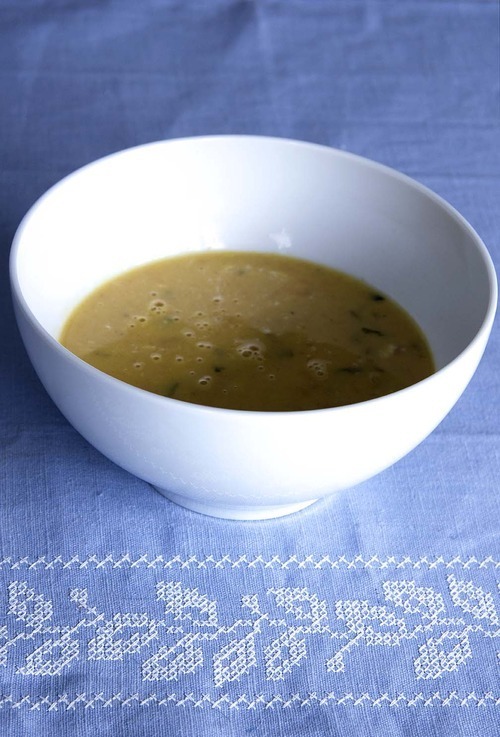 This soup is best made the day before it is needed to allow the flavours to develop. 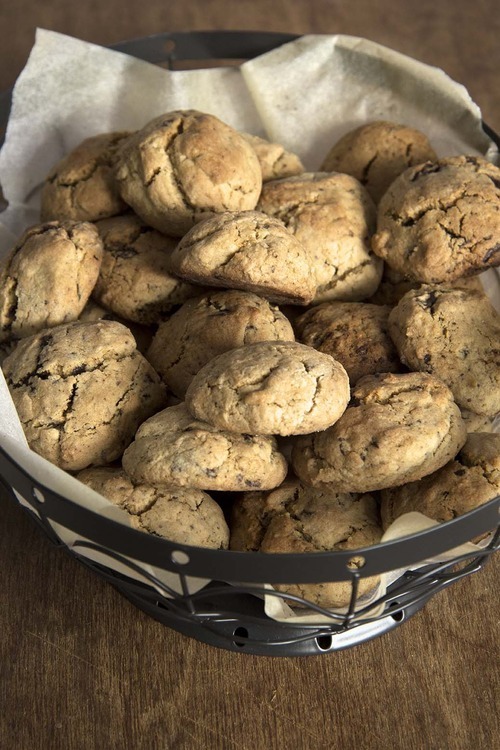 I made these delicious cookies, by adapting a recipe from Food for Living, by Rachel Allen, so that they were gluten free. They lasted long enough to take the photos- and then they were gone! In a large bowl beat the peanut butter, softened butter, sugar and vanilla extract until soft and creamy. Gradually beat in the egg and then add the chocolate. Stir in the flour, xanthan gum bicarbonate of soda and salt until well mixed. Using wet hands roll the mixture into balls about the size of a walnut, and then place them spaced well apart on a baking tray. Bake for 12-16 minutes until lightly golden. 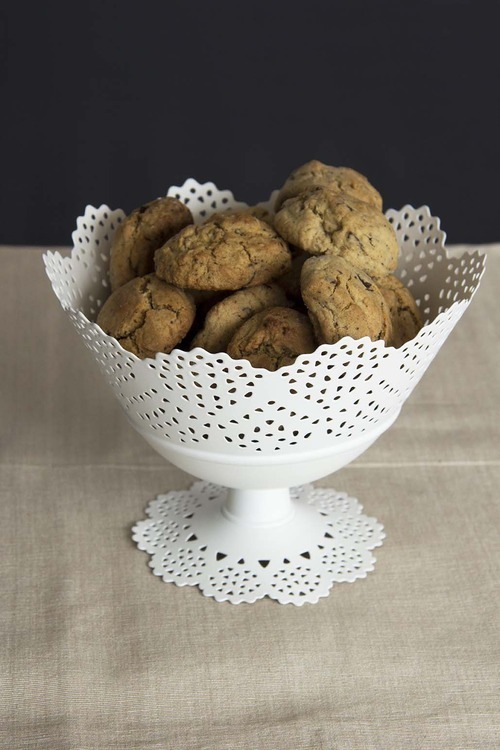 Carefully place the cookies on a wire rack to cool. I tend to use favourite recipes over and over again and unless I’m entertaining, those recipe books remain on the shelves. I recently vowed to look at all of my books, as I’m sure that there are some recipes that are worthy of joining the favourites list! I often adapt recipes to either make them gluten free or to use the ingredients I already have. 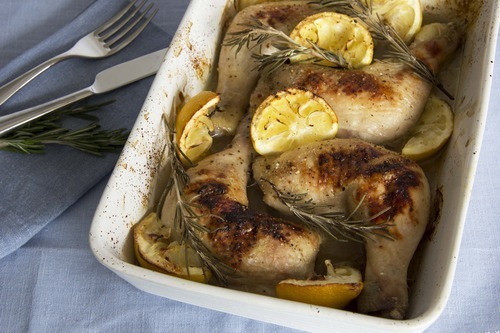 However some recipes shouldn’t be changed and certainly can’t be improved and Lemon Honey Chicken is one of those. Not only does it look delicious, it smells wonderful as it is cooking! Place the chicken pieces in a baking dish, skin side up. Mix the lemon juice with the honey and pour over the chicken. 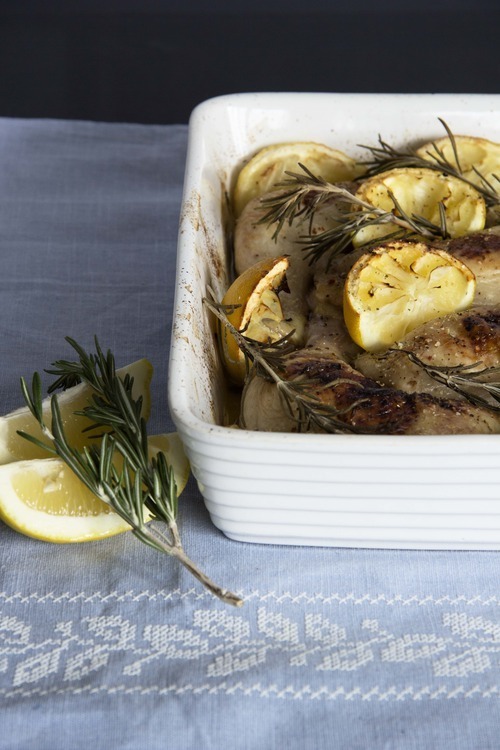 Place the remaining lemon in the baking dish with the chicken. Season with salt and pepper and tuck the rosemary sprigs in between the chicken legs. Bake in the oven for 40 minutes until golden. Remove the chicken from the oven discarding the lemons. Serve with rice or roast potatoes and green beans. 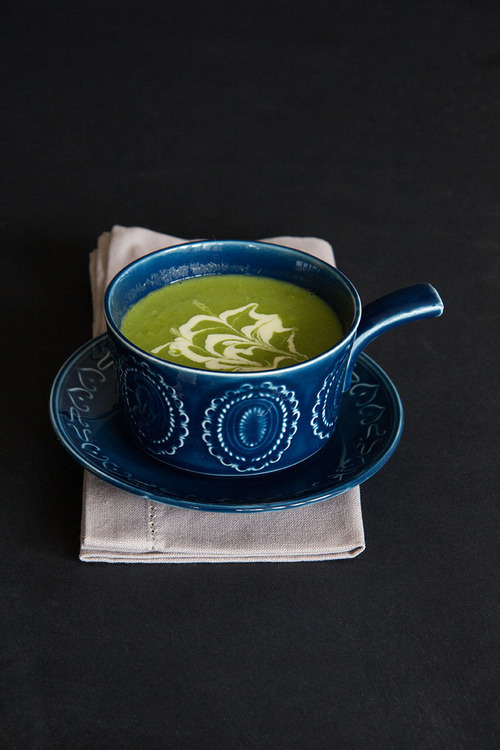 This is a very delicious soup and is very simple to make. Perfect for a cold winter lunch, eaten in front of a roaring fire. Why would you want to buy ready-made? Melt the butter and cook the garlic and onion very gently until soft, but not coloured in a covered pan (about 10 minutes, but do check regularly). Add the chopped carrots, stock and nutmeg. Bring to the boil and cover pan. Simmer gently for 20 minutes until the vegetables are tender. Cool a little and then blend until smooth. Return the soup to a clean saucepan with the chilli flakes, if using. Stir in the grated carrots, coriander and cream. Season to taste. Garnish with a swirl of yogurt (don’t worry if it sinks like mine did- add a little water to the yogurt, to thin it, and then it should stay on the top in a pretty pattern!). Cook the onion gently in oil until softened but not coloured. Stir in the peas, followed by the stock. Bring to the boil and simmer for 12 minutes. Allow to cool slightly and then blend in a food processor in 3 batches, until smooth or use a hand blender. Return the soup to the pan. Bring to the boil and simmer for 2 minutes. Season to taste and the pour into warmed bowls. 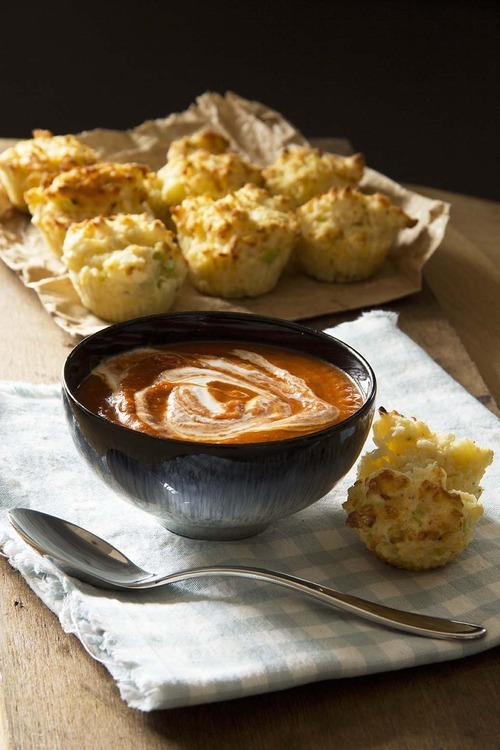 Swirl a teaspoon of cream into each bowl of soup to garnish. Make the syrup by putting the sugar in a saucepan with 100 ml water. Heat gently until the sugar dissolves, then bring to the boil. Boil for 10-12 minutes until it is the colour of amber. Remove from the heat and carefully add the espresso coffee. IT WILL SPIT! Line 2 baking trays with baking parchment. 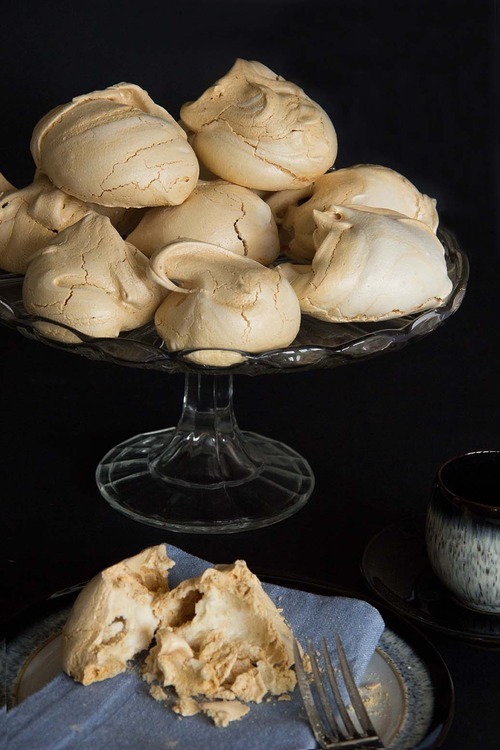 Whisk the egg whites until stiff and then gradually add the sugar, whisking after each addition, until you have a thick glossy meringue mixture. Fold in the cooled coffee syrup, to give it a marbled appearance. Spoon 6 mounds of meringue mixture on to each baking tray. Gently place in the oven for 1 hour. 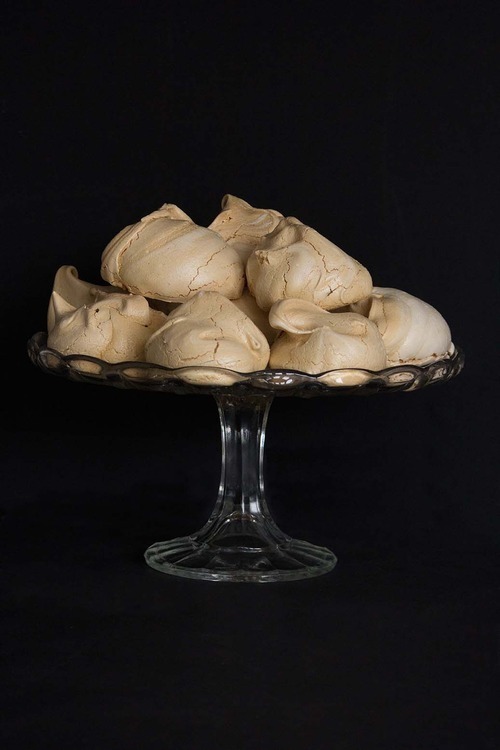 DO NOT open the oven when the hour is up, Turn the oven off and leave the meringues inside to dry overnight. This will give you a crisp meringue. 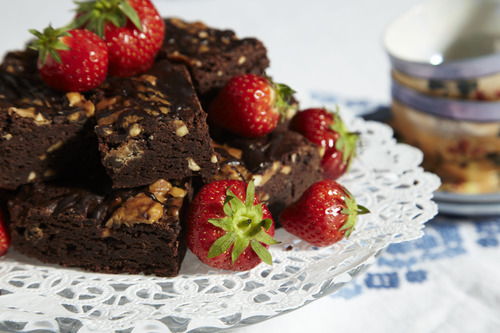 These are delicious served with whipped cream and berries (with perhaps some more coffee syrup drizzled over the top!) or with after dinner coffee. 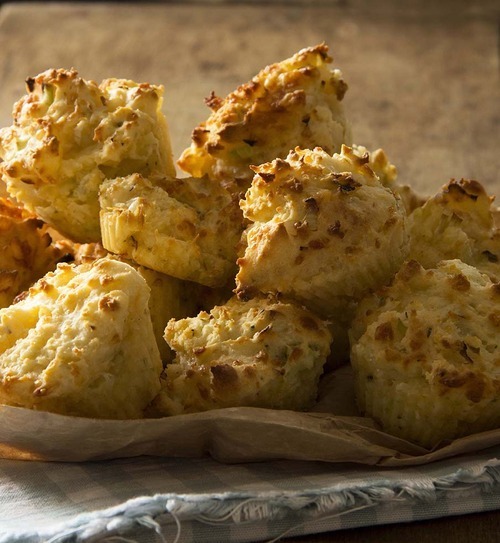 These are very delicious and so easy to make. They can we made with wheat flour, in which case, leave out the xanthan gum.